Back in January, Liberty London launched an Open Call competition, giving UK-based designer-makers the chance to be stocked in its store and online. Over 9,500 artisans entered via Instagram in a bid to be chosen for this thrilling opportunity, before a shortlist was created by Liberty's buying team and put to a public vote. Earlier this week, Liberty London revealed the three winners at a high profile event in partnership with, and launching, London Craft Week. The chosen winners were awarded by interior designer Ashley Hicks, while TV presenter Laura Jackson revealed the winners through Instagram. Originally from Lithuania and now based in Letchworth, Rūta Bartkevičiūtė creates modern, playful ceramics with a strong visual connection to her homeland. Her craft technique uses low-temperatures, which allows unrestricted use of vivid shades on materials. Prices for Rūta's pieces range from £300-500. 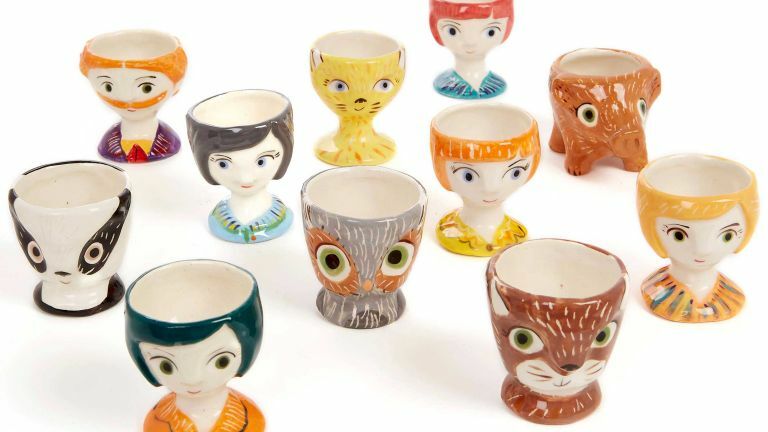 From Hebden Bridge in West Yorkshire, ceramicist Katch Skinner makes earthenware egg cups, which are slip casted from plaster moulds, carved and decorated by hand. Her charming cast of characters includes an assortment of faces along with foxes, cats, badgers and owls. Better known for more architectural sculpture, Kent-based Alex Chinneck has produced a limited-edition series of artwork called 'Blood, sweat and tears of joy'. Taking the form of a humble broom, the sculpture was has an impressive knotted structure, and was carved from ash wood over the course of 10 days. 'I like to make everyday items appear extraordinary,' he says. As a result of the competition, this is the first time that Alex Chinneck’s work has been commercially available to the public.